In order to get started over the amazing features of the exclusive Windows 8, you need to login to Windows 8. Yupp…you heard it right. The very new Microsoft’s Windows 8 require a Microsoft or Hotmail ID to login through. 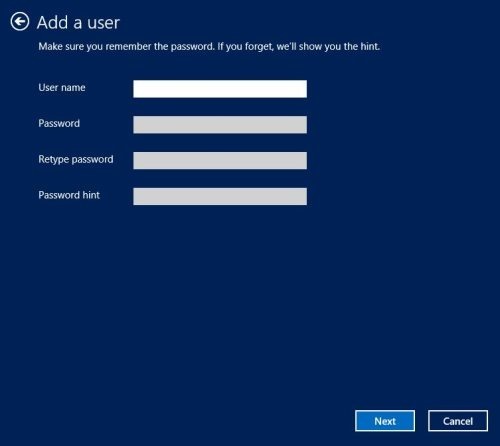 Now, it’s not possible to personalize Windows ID. Hence, I had to share my Password with my naughty little brother. Only and only this “Sharing Widows 8 Password” made me to add users to my PC. After a tiring R&D, I finally reached the right panel. For new Windows 8 users, it’s a bit learning task to add users to Windows 8. Hence, here I have tried to jot down a step-by-step tutorial on how to add users to Windows 8. Like we had a guest and an admin account in Windows 7, similarly, here in Windows 8 I create two user accounts…of course, one for my personal usage and the other for my cool and rocking brother. From the “Charms Bar”, launch PC Settings . Just press the Window key+C to launch charms bar. Click “More PC Settings” to access PC settings. Selects “Users” from the left bar, then password, & password hint. Click on “Add a user”. You will now be required to enter Microsoft Account email address, followed by a password. 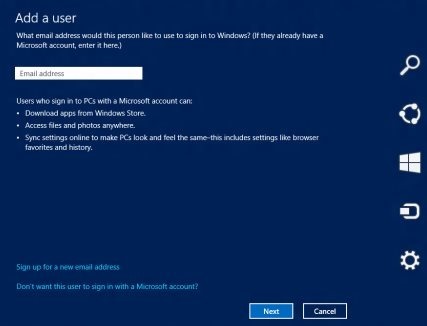 In case , you don’t want to add Microsoft account, you need to click “Don’t want this user to sign in with a Microsoft account”. 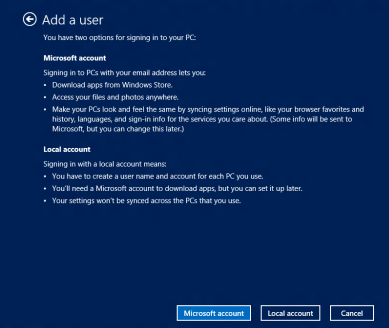 This will enable you to view Microsoft account and local account. Then, add user name, password, retype password and password hint. Click on “Next” to move ahead and finish. 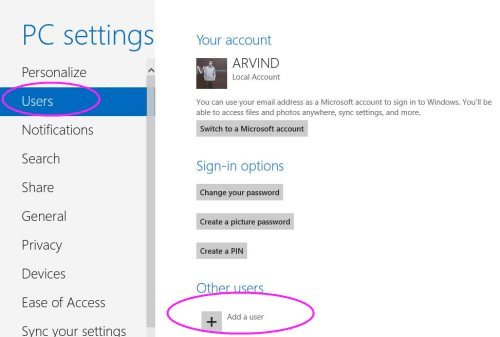 In case you opt for Microsoft account and not for local account, you will be able to sync settings and data with cloud. 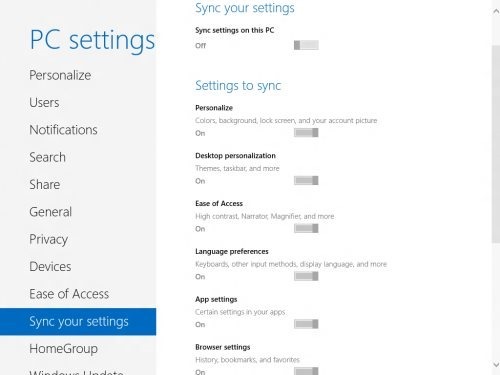 You will find an extra option under “PC Settings” called “Sync PC Settings”. Log in with Microsoft account and switch to “Sync PC Settings”. Sync PC settings helps you to sync all your PC settings like windows color, bookmarking, lock screen and much more, even if you login to any other PC with same account, you will able to retrieve all your settings to that PC. 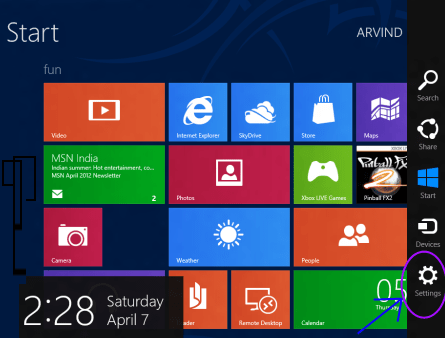 Also, check out our post on How to Personalize Windows 8. This is a turning edge for Windows 8, which takes Microsoft to a different level. Hope so, you must encourage Windows 8 to reach its peak.